Stephen Kellogg is a friend of a friend (or several friends, actually). Even so, I’ve never met him, and though I’ve seen him once or twice, I couldn’t have named a single of his songs… until last night. 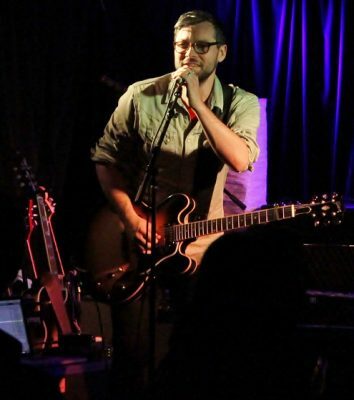 His newest album, Blunderstone Rookery, came out this summer, and when I heard he was playing Cafe du Nord on a chilly Wednesday night, I couldn’t think of anything else I needed to do. It was about time I finally laid ears on him, and a bonus, too: opening act Fort Atlantic. It wasn’t hard to find a girlfriend up for some live tunes, and soon we were settled into the dim venue with a plate of their fantastic fried pickles, ready for the night to get rolling. “Let Your Heart Hold Fast” was next, after which Black put his harmonica back on for “There is Love,” which was significantly slower than the other songs. I’m not sure that’s why I liked it so much, but I did definitely enjoy it. By comparison, though, next song “No One Will Know” was far too loud. Even so, it was a good song. “Alright, San Francisco. How we doin? '” Black went on to introduce band members. “Really?” He teased his drummer. “That’s all you got? After what they gave you? !” A quick shout-out to the bassist, an introduction for himself, and a plug for their merch selection. “If you collect compact discs, boy do we have a treat for you!” And then before I knew it, it was over as quickly as it had started. A band I’d never heard of had taken the stage, rocked my world for a few sweet moments, and abandoned me for bigger things. 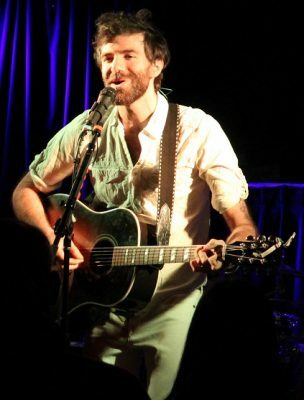 When Stephen Kellogg appeared on the du Nord’s tiny stage a little while later, two things made me smile simultaneously: the first, that he came out to Dean Martin’s “That’s Amore,” and the second, more topical: that he’s freaking adorable. (Yes, I know he’s married. But he’s still cute!) “Satisfied Man” drove home the point that he is happily married, being clearly autobiographical (as, it seemed, would be the case with most of his material). Even so, he’s still cute and I just decided to sit there, enjoy, and be jealous of his wife. “How you doin?’ It’s good to see ya, San Francisco!” He indicated that he’d taken to calling his tour band the “Gay Tarantellas” in reference to the Dean Martin track before explaining that his set would include some old songs as well those from his new album, like next song “Lost and Found.” After it came “Gravity,” featuring a shout-out he likely changes in every city: “nothing so sweet as a San Francisco crowd…” Naturally, it was met with the expected applause. “Man, it’s so good to be out of the car!” Kellogg exclaimed, adding that the tour had stopped in Portland the night before. He elaborated, saying that “San Francisco is always an emotional stop,” and that one time he’d decided to fly, so as to be able to have plenty of time and relax: only to have his flight delayed by nine hours. The result is that he always feels “a little cracked out” in our fair city, which he said was “like the population, as evidenced by those around our hotel,” which he called “not a nice area.” He even admitted to paying “about a hundred bucks so far” to various people in hopes that they could help keep his van safe. “But,” he insisted. “We’re happy to be here!” The crowd was obviously happy to have him, and cheered at the statement. There are so many songs in Kellogg’s catalog that are about family in general, or his own family, that he admitted he “started to feel like a grown up Raffi!” Finally, he said, he “decided to write some other stuff.” The next song, “Men and Women,” was an one such ‘other’ song. “The other theme about this record is, I’m not getting any younger!” Kellogg confessed. He continued, saying that he wasn’t freaked out, that he enjoyed “not being so insecure about having a view point.” Before the next song, he requested, “when I say ‘it’s all right,’ you shout back ‘it’s all right! '” calling it a “positive affirmation.” The song was “The Brain is a Beautiful Thing,” and the call and response worked well. “Start the Day Early” came next, and was perhaps my favorite of his set: it’s very catchy, and the crowd didn’t hesitate to sing along. Out of nowhere came a harmonica and a brilliant little cover of Whitesnake’s “Here I Go Again” worked in, followed by a little each of Guns N Roses’ “Paradise City,” Poison’s “Every Rose Has its Thorn,” and Def Leppard’s “Pour Some Sugar on Me.” “Those are the songs that made me wanna be right here right now,” Kellogg declared. 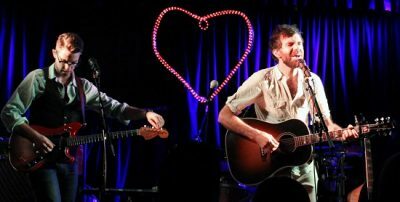 “Jetpack” and Stephen Kellogg love San Francisco. Jon Black’s project Fort Atlantic was the best new band I’ve heard in a while. “The Bear” was next, which was a good old-fashioned pop/rock jam. Simply put, this song is fun. “Thank you guys so much for being here; it means the world to me,” Kellogg gushed. He insisted that he was seeing “people I’ll never ever forget the faces of, really,” and added that he’s been doing it for thirteen years. He had one more song, he said, and before he left, a final plug for the new record. He mentioned that while he understood “we all have Spotify,” which has the lyrics, and who played what… “If you’re old like me, and like that, we have lots of vinyl, a songbook thing…” as well as t-shirts designed by a San Francisco native. (More applause, especially from a du Nord employee: “that’s my brother!”) There was also a tour poster, a tote bag, and the truth: it was basically “a friggin’ Urban Outfitters back there. Onesies! If you made a baby tonight, accidentally… Like me. I make accidental babies every time I go home.” Kellogg’s last song was, he said, about gratitude. “I’m very, very grateful.” The song was appropriately titled “Thanksgiving,” and was lyrically powerful enough to give me the chills. It seemed a bit of a somber note to end on, but when he got to the line “it sounds like hmmm….” the whole room was softly humming with him, to wonderful effect. At its end, Kellogg bowed to the cheers and left the stage. “More!” People in the room shouted. “One, more, song!” Moments later, Kellogg reappeared with the full band in tow. “It’s all right,” he said to the audience. “It’s all right!” They shouted back. “Roots and Wings” began the encore, which was much more uplifting than the previous song had been, featuring a great audience clap-along moment. “Did you guys have fun? Everybody have fun?” Kellogg asked after the song had finished, stepping off the stage and into the dark room, surrounded by fans. “Since we don’t wanna say goodbye, since we’re gonna see you again hopefully, we’re just gonna say ‘see you later, see you soon. '” And there in the darkness of the du Nord’s floor Kellogg played the evening’s final song, “See You Later, See You Soon” with all the fans singing along. It was a perfect end to a great evening, and Mr. Kellogg, the feeling is mutual: I’m gonna see you again, hopefully.